One of the most contentious issues in politics today is the propriety of electing judges. Ought judges be independent of democratic processes in obtaining and retaining their seats, or should they be subject to the approval of the electorate and the processes that accompany popular control? While this debate is interesting and often quite heated, it usually occurs without reference to empirical facts--or at least accurate ones. Also, empirical scholars to date have refused to take a position on the normative issues surrounding the practice. Bonneau and Hall offer a fresh new approach. Using almost two decades of data on state supreme court elections, Bonneau and Hall argue that opponents of judicial elections have made—and continue to make—erroneous empirical claims. They show that judicial elections are efficacious mechanisms that enhance the quality of democracy and create an inextricable link between citizens and the judiciary. In so doing, they pioneer the use of empirical data to shed light on these normative questions and offer a coherent defense of judicial elections. 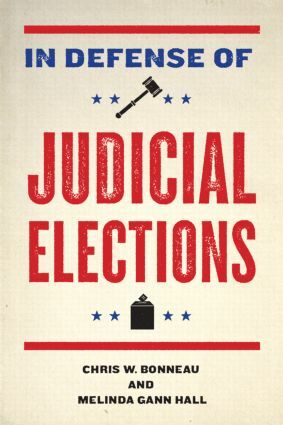 This provocative book is essential reading for anyone interested in the politics of judicial selection, law and politics, or the electoral process. Part of the Controversies in Electoral Democracy and Representation series edited by Matthew J. Streb.